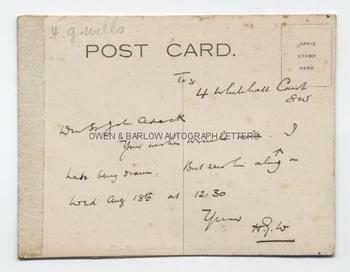 H G WELLS Autograph letter Signed. Herbert George Wells. British (English) author noted for his science fiction novels, including 'The War of the Worlds', 'The Time Machine', 'The Invisible Man'. etc. 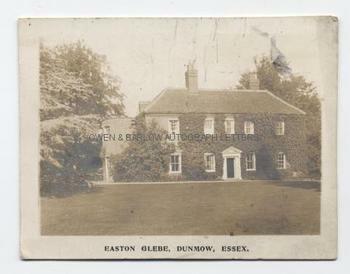 ALS (signed with initials) on verso of post-card showing a view of Easton Glebe, Dunmow, Essex. 4 Whitehall Court, SW. No date. To [Arthur] St John Adcock. "Your words [. . .?] mine. I have been drawn. But send him along on Wed. Aug. 18th at 12.30. Yours, H.W.G." Post card approx. 4.5 x 3.75 inches. Mounting traces to left edge. All else fine. Arthur St John Adcock was an author and was editor of 'The Bookman' periodical for many years. Adcock is principally known as the man who "discovered" the poet W.H. Davies but he also had a close association with many other authors of the day, with whom he was a frequent correspondent.